Sarah interviewed by Gayle Guyardo & Leigh Spann of WFLA/WTTA! 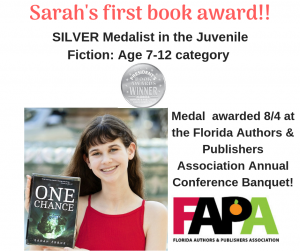 Sarah Frank was interviewed on her BOOK LAUNCH day by Gayle Guyardo & Leigh Spann of WFLA/WTTA! Follow Sarah on Social Media! Sarah has several social media accounts. Come along as we use #OneChanceTheBook #TeenAuthor and #BookLaunch to launch the book!